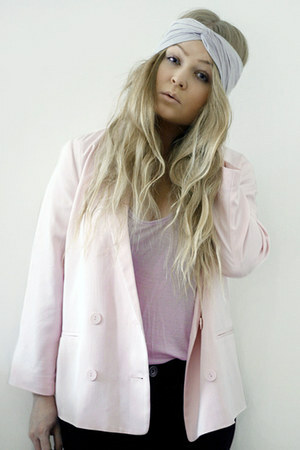 Monki Blazers first surfaced on Chictopia's streetstyle gallery in Spring 2011 seen on Stjärnhov blogger accordingtoannika of accordingtoannika.com. She wore her Monki blazer with a neutral Monki sheer fabric long rolled up sleeves shirt and sky blue Monki denim shorts. Since then, Monki Blazers have grown in popularity as bloggers from Stjärnhov, Copenhagen, and Poland But Living In Copenhagen have discovered them. Monki Blazers are generally seen in casual, preppy, and chic style. Popular types of Monki Blazers are oversized black long, long, stripes, and polyester. Blogger's favorite colors are black, navy, camel, and white. There are currently 33 streetstyle photos of bloggers wearing Monki Blazers. Most recently, blogger Yan of aeccrnticgirl.blog.163.com styled her Monki blazer with a dazzlin dress, straw hat, and H&M sunglasses. THE BACK TO SCHOOL OUTFIT - OR...?